Be the first to share your favorite memory, photo or story of Almus "Mac". This memorial page is dedicated for family, friends and future generations to celebrate the life of their loved one. Age 84 of Mount Morris passed away Wednesday, February 6, 2019 at Chesaning Comfort Care. Funeral services will be held 1pm Monday, February 11, 2019 at Nelson-House Funeral Homes, Owosso Chapel with Rev. John Walworth officiating. Burial will take place at Great Lakes Cemetery . The family will receive friends at the funeral home on Sunday from 2pm to 8pm. Almus was born April 15, 1934 in Durand, the son of Clarence and Rosetta (McLaughlin) Wiseley. He proudly served in the United States Air Force during the Korea Era. Mac was A lifetime member of the VFW Post 9455. 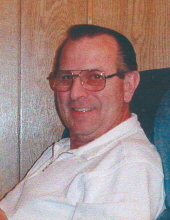 He was an avid outdoors-man and especially enjoyed golfing and boating. Most of all he loved spending time with his family. Mac married Shirley Day in Ohio on August 20, 1976. He retired from General Motors after 30 years of service as a supervisor. Mac is survived by his wife Shirley; daughters Linda Durfee, Carolyn Zmitko, Dianna (Ted) Stevens; step-children Debbie (Bud) Ward, Brenda (Rick) Renna, and Mark Whitt;14 grandchildren; many great-grandchildren and great-great grandchildren; brothers Robert Wiseley and David (Linda) Wiseley; several nieces, nephews and other loving family members and friends. He was predeceased by his son Alan Wiseley; daughter Rae Ellen Wiseley; 3 grandchildren Kevin Zmitko, Jeremy Wiseley and Michael Spencer; son-in-law Jerry Zmitko; step-daughter Marsha Lynch; brother Clarence "Ike" Wiseley; sisters Mary Ryan and Clara Maron. To send flowers or a remembrance gift to the family of Almus "Mac" R. Wiseley, please visit our Tribute Store. "Email Address" would like to share the life celebration of Almus "Mac" R. Wiseley. Click on the "link" to go to share a favorite memory or leave a condolence message for the family.